Lyrics from a 1965 song by the Beatles are what inspires artist Kevin Fitzgerald to create his colorful paintings of pristine nature, and you can check them out now through June 1 at Hughes Gallery, 333 Park Ave.
“They are very powerful words – ‘There are places I’ll remember, all my life, though some have changed … some forever not more better, some have gone and some remain’ – but they truly explain how certain things never change, like breaking waves or a path in the woods,” he said. The artist said he’s always been drawn to art that employs clear simplicity over excess complexity to tell a story, whether it’s music, a book, a movie or a painting. Most of Fitzgerald’s days are spent in his studio setup in a 5,000 square-foot barn in Berlin, Maryland. It’s about two miles away from Assateague Island State park. Fitzgerald has been coming to Boca Grande for the past 15 years to share his work. Two pieces at the gallery right now – “Ocean Twilight” and “Morning Clouds” – were both inspired by spending time on beautiful beaches in Maryland and on Gasparilla Island. The paintings are filled with life and emotion. They are simple and evocative, and the arrangement of color and light temporarily slows you down. “Places like Boca Grande very much stay the same … and that’s part of the secret appeal of the island,” he said. Fitzgerald’s grandfather was a visual artist, who taught Kevin to paint when he was five years old. He can still recall what the paint smelled like in his grandfather’s home studio. He actually attended the same art school that his grandfather attended, the Maryland Institute of Art. After receiving a degree, Kevin worked as a teacher for many years, continuing to create art as his main hobby. He was able to retire in 1999 when sales of his paintings started to take off. The artist also authored a book in 2010 featuring selected pieces of his work as well as excerpts from several publications. Fitzgerald would like to thank Barbara Hughes for welcoming him to the island over the years. 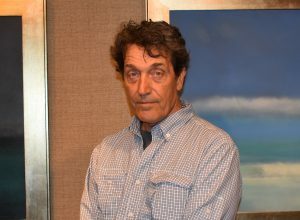 To see more examples of his work visit kevinfitzgeraldpainter.com. Older PostAre you ready for John Storms the Reptile Man?